The very first corporate org chart was created in 1854 by Daniel McCallum, general manager of the New York & Erie Railroad. At the time, the New York & Erie was the world’s biggest railway network, spanning 500 miles of track. This created a thorny management challenge: how to keep track of all the trains, and the various personnel needed to keep them running smoothly, safely and on time? McCallum had plenty of operational data coming in from all over the network via telegraph, the bleeding‑edge communication technology of its time. The problem, as Caitlin Rosenthal explained in a 2013 McKinsey Quarterly article, was that McCallum and his fellow executives had limited ability to process all that data. Administrative mistakes could have serious consequences. For example, each train delay disrupted the entire schedule. If managers failed to track all those scheduling impacts accurately, they risked not just annoyed passengers but the head‑on train collisions that plagued the 19th century railroad industry. McCallum’s solution was to visualize his organization in the form of a chart. His org chart looked nothing like the modern convention of boxes connected by lines, arranged in a pyramid structure with bosses above and minions below. Inspired by the aesthetics of his day, it looked more like a tree in bloom. McCallum and his fellow executives appear as seeds at the base of the tree. Lines, representing railway tracks, rise from the seeds like branching tree trunks. Tendrils curl off from the trunks, representing the various employee categories (schedulers, engineers, switch operators, mechanics) that kept the railroad running. McCallum’s chart represented a fundamental insight about his business. In order for the New York & Erie to operate safely and efficiently, decision‑making power could not be concentrated at the senior management layer. Instead, it needed to be distributed to the employees who were directly responsible for scheduling the trains and keeping them operational. In this, McCallum anticipated modern management fads like servant leadership and the matrixed organization. One difference between the mid‑19th century and our own day is that managers have access to far more information about their organizations and the markets in which they operate. 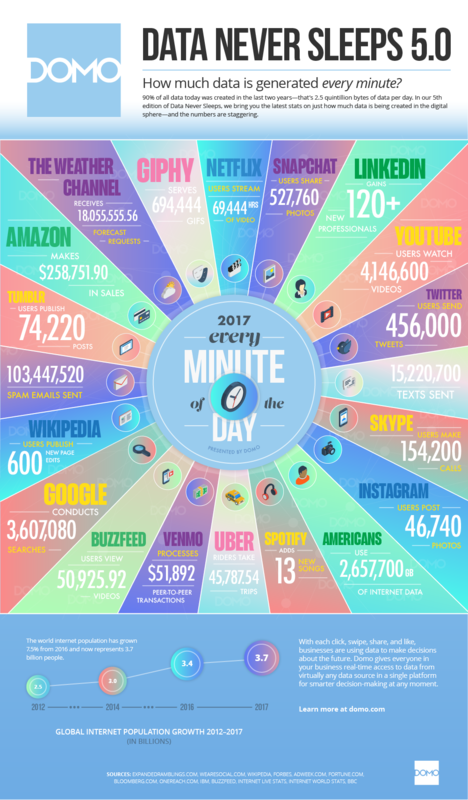 The human race produces 2.5 quintillion bytes of digital data every day, according to Domo’s Data Never Sleeps 5.0 report. Roughly 90% of all the data in the world was created in the past two years. About 4.2 billion people are now connected to the Internet. Google alone processes 40,000 web searches every second. Every day, people watch 5 billion YouTube videos. Managers also have far better tools to process operational data. Because of the exponential growth in computer processing power described by Moore’s Law, today’s computers are dramatically more capable than the hulking mainframes that flickered to life back in the 1940s. That computing firepower runs intelligent applications that are steadily digitizing the workflows that define every business function, from HR to finance, procurement, customer service and IT. Thanks to the Digital Revolution, organizations run at peak efficiency. Accidents don’t happen. Employees everywhere are blindingly productive and blissfully content. Markets operate with perfect transparency, while poverty, hunger and disease have vanished from the earth. Problem solved, right? OK, not quite. Arguably, modern business challenges differ more in scale than in kind from those of the Victorian era. Today’s managers wrestle with many of the same challenges that led Daniel McCallum to create his revolutionary org chart. Despite the data deluge washing over them, they still make decisions with imperfect information. Bad decisions often have severe consequences, and even good ones yield unforeseen outcomes. In response to these challenges, many companies are developing organizational models that look a lot like the New York & Erie Railroad in the 1850s. In the current edition of Workflow, Brad Howarth shows how the online retailer Zappos and the Australian digital media company REA Group are flattening organizational hierarchies, improving information flows and pushing decision rights to the edge of the enterprise. One clear difference between the 19th century and today is that modern employers face a dramatic digital skills gap, as our infographic shows. Howard Rabinowitz reports on how corporate badge programs are starting to help companies fill that gap. Finally, Riva Froymovich explains how HR pros are using task automation and advanced analytics to better serve their employees. I hope you enjoy Workflow. To get fresh stories delivered to your inbox every two weeks, please sign up for our email newsletter. Meanwhile, here’s hoping that your trains all run on time in 2019.